We’re delighted to introduce an array of Lyle and Scott SS17 new arrivals at Apache Menswear. Ranging from spring weight jackets and vintage cable knitwear, to classy button down shirts, this year’s crop is one to savour. Not only are we proud to be an official stockist for Lyle and Scott SS17 gear, we are also giving an awesome 10% discount to all wonderful Apache customers! Just use the code LYLESS17 at the checkout to save on a wide range of brand new garments. 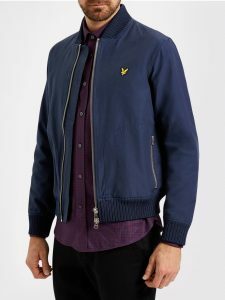 This bomber jacket jumps out at us as an instant Lyle and Scott modern classic. With heavy-duty knitted cuffs, welt and collar, the garment is very lightly lined to protect you from those April showers — great to wear over a Polo Short on cooler evenings. Also featuring a chunky double zip, sturdy front zip pockets, and bonus inside pocket. 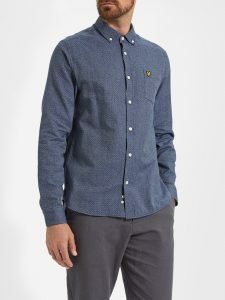 The core Navy colour has been a Lyle and Scott staple for as long as we can remember — and there’s a Dark Sage Green version, too. It’s not often you see a quality Sweatshirt with a front pocket. 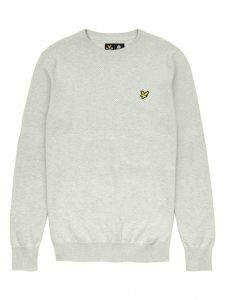 This one has the bonus of the iconic Lyle and Scott golden eagle badge. Made from a classic Oxford cotton weave, this Lyle and Scott SS17 garment is un-fleeced, using instead a soft loopback cotton. Why have they taken this approach? Firstly, fleeced material is often too heavy and can “pill” over a T-Shirt worn underneath. 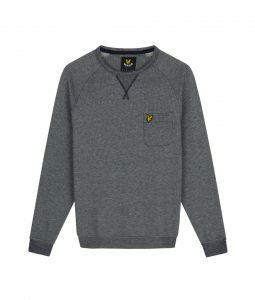 Secondly, most people wear this type of sweatshirt on its own, or layered with a T-Shirt or Polo, making it an ideal Spring Summer sweatshirt. This casual button down shirt has already sold like hot cakes at Apache Menswear and is an undoubted Lyle and Scott SS17 highlight. Boasting a beautiful twill mouline design for a tonal white-grey-blue 3D effect it’s a perfect match for a pair of jeans or smart chinos. Little touches include a box pleat and loop on the back, and a classic breast pocket. The semi-tailored fit is comfortable without being tight fitting. As you’d expect from Lyle and Scott — with a heritage of Scottish knitwear since 1874 — this is a beautiful piece of knitwear. Using fine-gauge cotton, this spring jumper has a delicately soft textured weave that is a delight to touch and wear. The advantage of fine-gauge cotton is that it is breathable, meaning you wont perspire in the summer months — and unlike wool it isn’t itchy. Also available in Navy in the Lyle and Scott SS17 collection. Get down to Apache Online and use the code LYLESS17 for 10% off all Lyle and Scott SS17 clothing!